Alty's last visit to Woodley saw them win 8-1 in the Cheshire Senior Cup. Since then the ground had gained an impressive new stand which is to be officially opened by Brain McClair in the next few days. Unfortunately a number of seats have already been broken by mindless vandals but the pitch and ground as a whole were an impressive tribute to the Woodley Sports club. Altrincham sported the "unlucky" orange kit which had been worn very infrequently since its disastrous debut at Frickley the season before last. With Graham Heathcote on holiday, Dalton Steele was in charge of the team tonight. 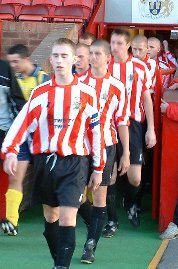 Right: Paul Glynn leads out the youth team last season against Frickley. Alty fielded a surprisingly strong starting line-up, with all eleven being regular starters or squad members from last season's UniBond side. On the bench were eight other players, who included Chris Adams and Neil Ryan, plus four players (Lunt, Glynn, Ekolongeni, Griffiths) from last season's Youth team and two new faces. These were recent signing Steve Aspinall from Vauxhall Motors and Rob Matthews, formerly at Halifax Town and Northwich Vics, who has been training at Moss Lane. Mattie Hughes warmed up with the players but took no part in the game; he is suspended from competitive action till the second game of the season. There were no teams listed in the programme and there was no announcement of the line-ups so I will try and fill in the Woodley names later, below. WOODLEY SPORTS (Red & blue shirts, blue shorts, red socks) : 1. ALTRINCHAM (All orange): 1. Richard ACTON, 2. Gary SCOTT, 3. Barry SHUTTLEWORTH, 4. Mark MADDOX, 5. Gary TALBOT, 6. Stephen ROSE, 7. Andy TUNNICLIFFE, 8. Ian CRANEY, 9. Peter BAND, 10. Rod THORNLEY (capt.) 11. Paul ROBERTSON. Subs: 12. Paul GLYNN, 14. Neil RYAN, 15. Joel EKOLONGENI, 16. Chris ADAMS, 17. Mark GRIFFITHS, 4* Steve ASPINALL, 7* Rob MATTHEWS, 9*. Stephen LUNT. Woodley provided Altrincham with a good early test and look to be heading for a good season. Altrincham were much improved after the interval when numerous changes were made to the line-ups of both sides. The game was decided by a well-taken goal by Paul Glynn. The game got off to a lively start and Woodley's impressive left-winger (who I think was Simon Hackney, recently signed from Nantwich Town) gave an early indication of his ability with a fine advance up the left and a testing cross, which was nearly converted by a team-mate (3 mins). Alty responded when Rod Thornley latched onto a through ball on the right but his shot went narrowly wide across the face of the goal (5 mins). Andy Tunnicliffe on the Alty right showed some early determination but the game was fairly even at this stage. A Peter Band half-volley was then well saved (11 mins) before Hackney caused Alty more problems on the left with his pace. Woodley were playing some good passing football which suggested that they will have a good season in 2003-04. Richard Acton was soon obliged to race out of the corner of his box and was adjudged to have fouled a Woodley attacker, though being a friendly he suffered no more punishment than a free-kick. This was very quickly taken, before the keeper could get back into his net. The free-kick cleared Richard but was kicked away by a covering Alty defender. This led to a melee in the box with desperate blocks by Alty defenders seeing off the danger (17 mins). A Woodley corner followed soon afterwards, which was scrambled away, before at the other end, a Craney mis-shot came to Thornley who, in turn, failed to get hold of his effort. Nevertheless, Rod's effort only went very narrowly wide of the Woodley upright (18 mins). After another Woodley corner had been cleared, the Woodley captain found himself clear but Acton made a great block to his shot (23 mins). Woodley were now having the better of the game with Hackney the main danger man on the left. A foul on Craney on the left front-edge of the box gave Alty a free-kick which Craney himself curled just wide (25 mins). Mark Maddox then came off with what looked like a slight strain and he was replaced by Chris Adams (28 mins). Woodley continued to produce the slicker passing of the two sides with the no.3 and no.11 combining especially well. Craney got in a 25 yarder which went wide after a feed by Thornley (33 mins) before Alty finally won a corner from a deflected Thornley effort after Band had chosen to pass to his captain rather than shoot for himself (35 mins). Thornley then shot over the bar (36 mins), with the floodlights now illuminating proceedings (39 mins). Alty won another corner as their performance picked up but Scott was still having to be alert to keep Hackney under control (41 mins). Woodley's nos. 6 and 11 then combined and the latter's shot forced a one-handed save from Acton which yielded a corner. However, the last chance of the half was a chip over the bar by Craney (44 mins). Altrincham were having a thorough pre-season examination from a useful Woodley side. Half-time saw a number of substitutions. With no announcements and with both sides recycling some of their first-half shirts it was impossible to say who the Woodley subs were. However, the threatening Hackney was one of the players who did not appear for the second half, to Alty's relief. Alty brought on Steve Aspinall (wearing 4), Steve Lunt (9), Rob Matthews (7) and Neil Ryan (14). They replaced Robertson, Band, Craney and Tunnicliffe. Lunt joined Thornley up front whilst Aspinall slotted into left midfield. Matthews, operating on the right soon impressed as he went past two defenders and from this advance a Lunt shot was deflected for a corner on the Alty right. Aspinall's corner was dropped by the keeper, under pressure, and another corner resulted which could only be taken after a long delay for a lost ball. Alty were now showing an improved performance and when the corner was eventually taken by Aspinall, Talbot met it with a superb goalbound header which a defender did well to clear. However, a ball over the top of the Alty defence set the Woodley no.10 clear but he did not capitalise on his chance and shot well wide. Lunt then had an effort blocked by the keeper as Alty continued to show more purpose in this half of the game. Soon afterwards a good pass from Ryan gave Lunt a good chance but he shot at the keeper (53 mins). Woodley now made two more changes with nos. 14 and 12 replacing 5 and 8 (54 mins). Alty won a free-kick after the keeper picked up a Woodley back pass but ruined the chance by taking it too hastily. Woodley then won a corner before Alty brought on another of last year's youth team, Mark Griffiths, at left-back as Barry Shuttleworth left the fray. Joel Ekolongeni, another player from the youth side, also came on at this point for Gary Talbot. Chris Adams moved to centre-back as Joel slotted into left midfield. (70 mins). Woodley's Japanese substitute then got in a good shot from 22 yards which Acton saved. After an Ekolongeni advance up the left had been cleared, Glynn and Thornley exchanged passes before Aspinall delivered a neat chip to Glynn, arriving in the box from the right, and he drove the ball cleanly home to put Altrincham one up (74 mins). Woodley almost got back into the game when the ball then ran under Aspinall's foot and allowed the no.9 to get clear but he was driven to the right and his shot went across the face of goal (76 mins). After Matthews had been fouled, following his skilful advance to the edge of the box, Ryan curled the resulting freekick just over the bar (77 mins). Acton gathered a shot from Woodley's no.6 before a fine Woodley tackle stopped Thornley inside the home side's box (80 mins). The entertainment continued with Woodley's no.2 winning a corner but this was overhit by no.12 (83 mins). Glynn, Ryan and Matthews then combined for the last named to force a good save from the home keeper before Thornley again shot over the bar (85 mins). Acton fielded a late shot and Adams had to be alert to concede a late corner but Altrincham ran out the winners. After a fairly rusty first half, Alty had improved after the interval but Woodley gave them a good test which belied the two-leagues difference between the sides.